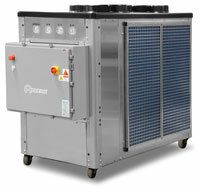 Advantage BC Series air-cooled chillers use mechanical refrigeration to cool recirculating fluid that support industrial process cooling applications. Glycol chillers are configured to produce fluid temperatures between 25°F - 30° using a mixture of water & glycol to prevent the fluid from freezing but can also be adjusted to produce fluid temperature as low as 20°F and as high as 70°F. BC models are designed for indoor installation. 2. Capacity at 25°F LFT and 115 °F condensing temperature. Capacities may be +/5% as reserved by the compressor manufacturer. 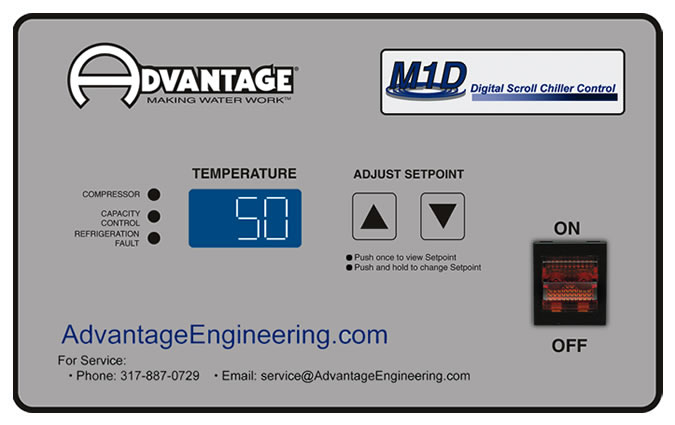 The minimum recommended operating temperature when no glycol is used is 48°F. 3. Capacity at 50°F LFT and 115 °F condensing temperature. Capacities may be +/5% as reserved by the compressor manufacturer. The minimum recommended operating temperature when no glycol is used is 48°F. 4. Design ambient conditions. Loss of capacity and/or difficulty operating will occur at higher ambients. Minimum recommended ambient is 60°F.